Eleonor, the daughter of Eleanor of Aquitaine, grew up to be all the things we tend not to associate with her mother. Put another way, Eleonor was a supportive wife and the matriarch of a loving and close-knit family. She was born in September 1161 at Domfront, in Normandy – one of the many territories of her father, King Henry II of England. Her early childhood was nomadic, as her parents moved between England and France. Then, when Eleonor was seven, they separated. Her mother went home to Aquitaine, taking her favourite son Richard with her. Leonor went too and, for the next two years, had her mother and big brother (the future Lionheart) to herself. Her father, meanwhile, got on with finding her a husband. King Henry settled on a teenaged Spanish king, Alfonso of Castile. But when the Castilian embassy arrived to collect the little princess from Bordeaux, Henry was not there to meet them. The king of England was ill – so ill he actually drew up his will – and Queen Eleanor was left to settle the terms of their daughter’s marriage on her own. Eleonor never saw her father again and had to wait another thirty years for a reunion with her mother. She was 9 when she arrived in Spain, while her new husband was 15. It wouldn’t be surprising if Alfonso had a fling while he waited for her to grow up – but the gossip about a seven-year affair with a Jewess of Toledo, known as “Beautiful Rachel”, dates from years after the king’s death (and the jury’s still out on whether Rachel even existed). 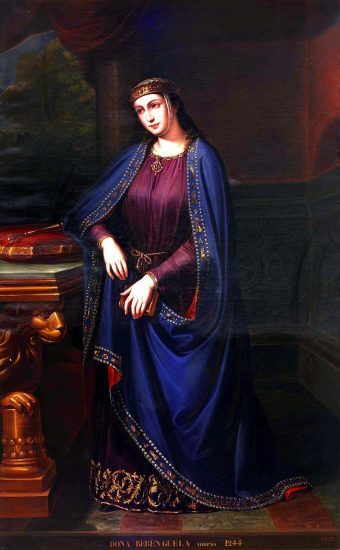 Queen Eleonor gave birth to her first child at 19. The baby, a girl, named Berengaria, who was quickly handed over to a wet nurse, Estefania. The queen was soon pregnant again, and this time she presented her husband with a boy. Eleonor’s delighted father sent presents to mark the birth – but sadly little Sancho only lived three months, and the silver plate and clothing arrived within weeks of his death in July 1181. Three more children also died at a young age. This left the princess Berengaria as the king’s heir. Her parents, moving from one royal residence to another, trusted her education to a governess. 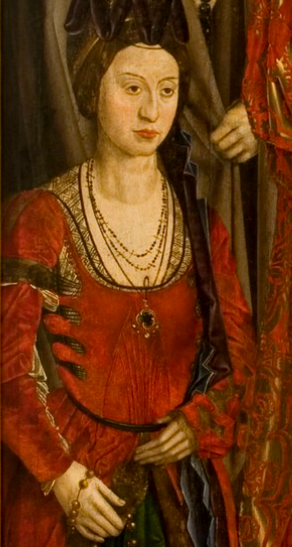 When Berengaria was nine, her father rewarded this lady, Dona Elvira, “at the request of my daughter”. The royal couple continued to try for a healthy son. New daughters were handed straight over to wet nurses so that the queen could conceive again as quickly as possible. Blanche, born in 1188, was given to a nurse called Sancha Lopez. With another woman feeding the baby, the Queen was soon expecting again. After a disappointing run of girls, this pregnancy ended with a precious son. This time Eleonor took no chances and nursed baby Ferdinand herself. It meant waiting longer for the next pregnancy – but a healthy son was worth the price. So naturally, the parents were devastated when Ferdinand died of fever in his early 20s. Eleonor was so distraught that she climbed into bed with her dying son, held him, and said she wanted to die herself. Ferdinand had wanted to emulate his uncle Richard the Lionheart and go on crusade. But there was no need to go to the Holy Land when Spain was also a frontier zone between Christianity and Islam. When Alfonso and Eleonor married back in 1170, the king promised his new bride half the lands he hoped to conquer from the Moorish kingdoms in the south (known as Al-Andalus). But sometimes the frontier shifted too far north for comfort, as when the king suffered a disastrous defeat in 1195. Which is why, two years later, the queen persuaded him to marry their eldest daughter to his rival, the King of Léon. It was sound advice from Leonor because the two men faced a common enemy – the Almohad rulers of Al-Andalus and North Africa. Although the Leonese marriage ended in divorce, it lasted long enough to produce a son – the future Ferdinand III – who united the two kingdoms of Castile and Léon in an important step towards the unification of Spain. In 1200, another daughter made a prestigious marriage abroad. And who should turn up to collect the bride, in the dead of winter, but her formidable grandmother Eleanor of Aquitaine? Thirty years had passed since the old queen saw her daughter. 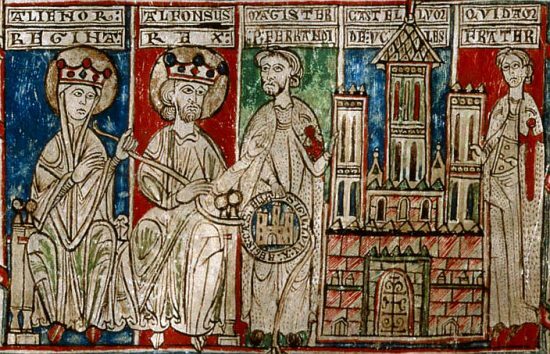 Like a good wife, Eleonor was also content to let the king be the centre of attention. She liked to sit quietly with her maids, while the court enjoyed the songs of the troubadours. That was never Eleanor of Aquitaine’s style, but she hadn’t come to Spain to make small talk. 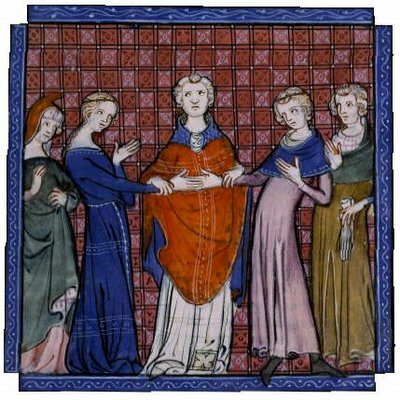 The last of Eleonor’s brothers – John – had recently become king of England, and he wanted a marriage alliance with the French king. As John had no eligible daughters of his own, he asked his sister and Alfonso to provide the bride instead. 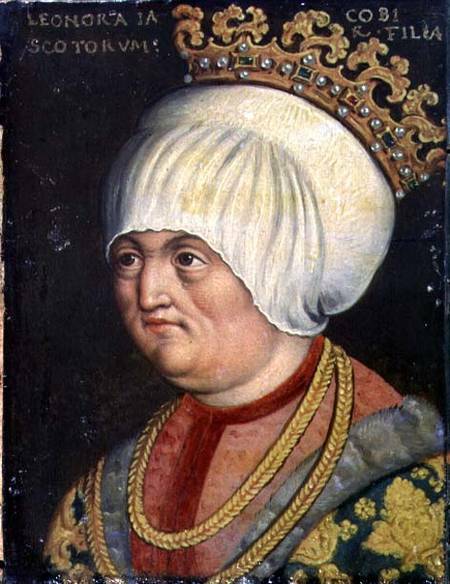 Eleanor of Aquitaine chose twelve-year-old Blanche, who left Spain with her grandmother in March 1200. The old queen stayed on in Bordeaux, while the girl travelled on to Normandy where uncle John was waiting to hand her over to her new husband, the future Louis VIII of France. Twelve years later, King Alfonso’s reign reached its climax. Queen Eleonor and her daughters were waiting anxiously at Burgos, when the king led a coalition of other Christian Kings to victory over an Almohad army at Las Navas de Tolosa on 16 July 1212. The victorious Alfonso sent on a tapestry from the caliph’s tent. But only with her father’s letter in her hands, could Berengaria relax enough to pass on the good news to her sister in France. Two years later, Alfonso VIII died on 5 October 1214. Eleonor was with him at the end. The dying king showed his respect for her, naming her regent for ten-year-old Henry – their only surviving son. The King’s body was embalmed and taken to the Cistercian nunnery of Las Huelgas in Burgos: built by Alfonso “because of his fondness for his wife”. Four of their children were already buried there. Source: Colette Bowie. The daughters of Henry II and Eleanor of Aquitaine: a comparative study of twelfth-century women, PhD thesis, University of Glasgow, 2011.